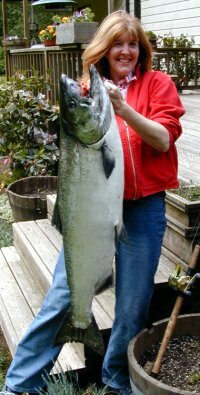 Coastal Fishing, Guides and Charters in Seaside, Astoria, Tillamook, The Wilson, The Trask, The Nestucca, The Nehalem, The Necanicum, Big Creek, Youngs Bay, The Columbia River. 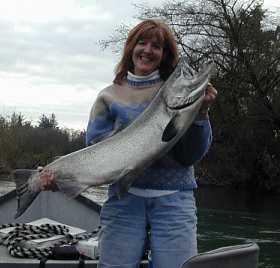 Here are some pictures of fishing trips that I have written about. 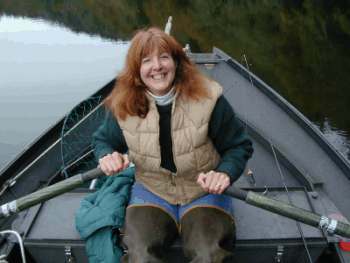 Reports on the Wilson, Trask, Nestrucca, and more! This page is graphic intensive, so be patient while it loads! 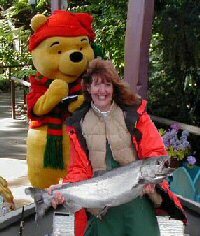 Nothing better than Disney salmon! 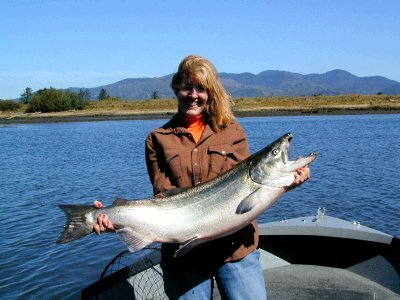 Tillamook Bay Springer, 37 pounds! 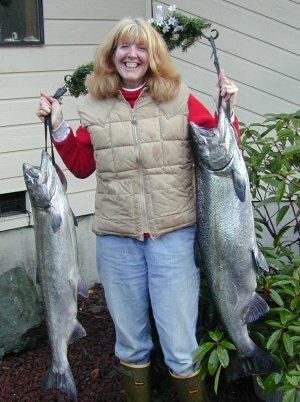 2001 Nehalem salmon on a eggs and Marie's Shrimp scent!! Out on the river, Herrrrrrrre fishy fishy!! Got one! You want me to lift this 56 inch sturgeon???? How high do want it? Arghhhh! 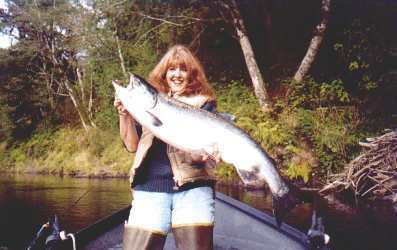 O.K., so it took me a lot of fishing to get rid of my pregnancy weight! Hefty woman! But fishing on that jetty and pulling in all these fish did help! 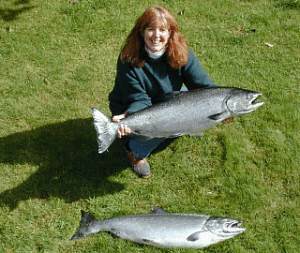 The thing I want to illustrate here is the fish weight not the Jennie's weight. 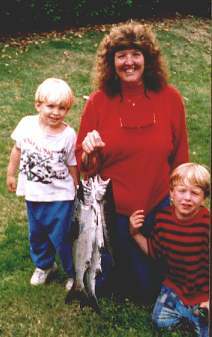 The pic is old and kind of fuzzy, but you can see I had no place to carry any more fish! I had such a great time, and you can see by the smile on my face that it was one of those fishing days I will never forget! My dog, Hershey, always goes with me, to this day! If he hears the word "Fishing", or if he sees me head to the garage for a rod, he is right behind me, wagging his tail. I think this was the second day I went out. Only caught three or so, but still a happy girl with my discovery! The kids were still just rugrats. How cute! David is in the white and Andrew in the red and black stripes. Now Andrew is 11 years old, 5'6", and wears a size 13 1/2 men's shoe! 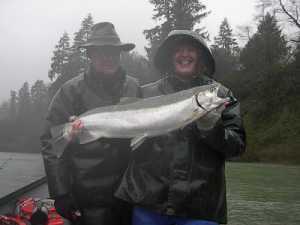 David is an avid sportster and seems to excel in every seasons offering. He is now 10. 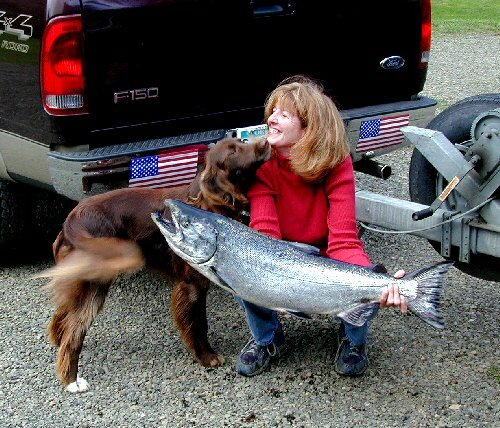 This is a pic of the Springer I caught off the beach in February of probably 94? I forget, but I thought it was interesting because of the weird nose. What do you think happened here? He wasn't very large, probably 12 Lbs. He did however, taste very good! What does a fish say when he runs into a cement wall?